Bags that love to travel from Quo, Avon and Sephora! Quo Tropical Summer Clutch - $16.99 - there's lots of room for all your beauty essentials in this frond printed, canvas coated case - the tassel makes it extra sassy! Avon Train Case with Mirror - $20 - with a roomy interior that is lined for easy cleaning, wraparound zip closure and a mini mirror for on-the-spot touch-ups. 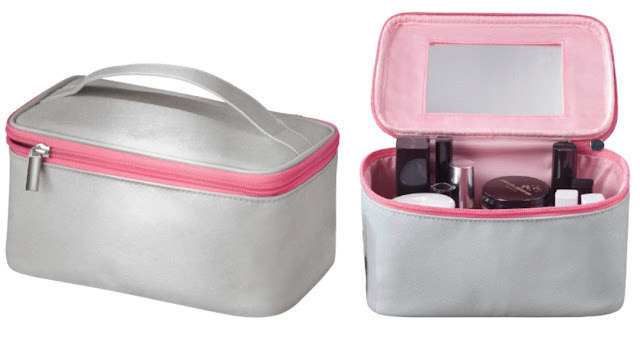 Sephora Sprinkle Me With Kisses The Voyager - $25 - a medium-sized, coated canvas makeup bag that holds and protects your beauty essentials and has a pop-up frame that provides you with better visibility of the products inside - and of course who doesn't love the whimsical design? !